three in one [over at deeper church]. | stuff antonia says. three in one [over at deeper church]. I know, I know. 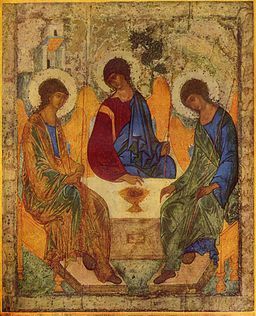 The Trinity icon everyone uses. But that’s because it’s awesome. Howdy, ya’ll. Today I’m talking about the Blessed Trinity over at A Deeper Church. Don’t worry, all of your questions and hangups about this ancient mystery will be answered in just 600 words! And you get a car and pony at the end! Which person of the Trinity did you grow up with? He does not imply the absence of any at a given time, of course. I know my answer right away: Spirit. It’s always been Spirit, I think, and maybe that’s why “Holy Ghost” sounds like someone else. The question itself haunts me. I’m over there wondering what happens when we emphasize or separate one person of the Triune God. I say when not if, because we do it all the time. Turn the questions over at A Deeper Church with me? ← it doesn’t need to be counted, and neither do you.